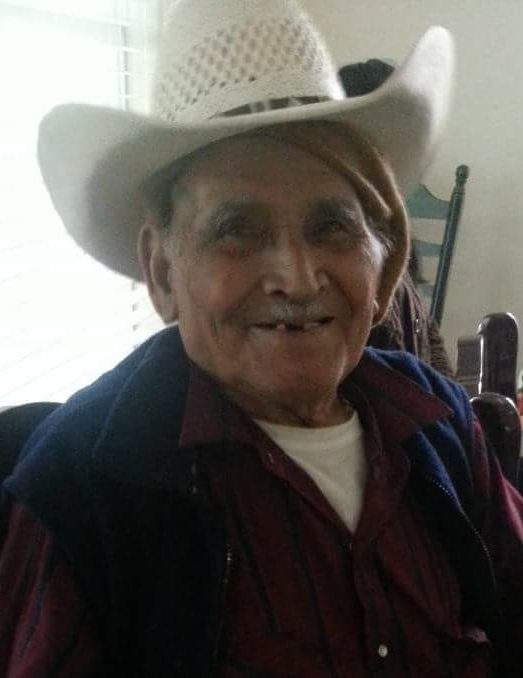 EDCOUCH – Estanislado Ventura, 95, passed away Sunday, September 9, 2018 at Knapp Medical Center in Weslaco. He was born May 7, 1923 to Amado & Marcelina Ventura in Mexico. Estanislado is survived by his wife, Dominga Ventura; sons, Juan (Estefana) Ventura, Felipe (+ Carmen) Ventura, Lorenzo (San Juanita) Ventura, Jose (Maria Raquel) Ventura, and Rosalio (Rosa Maria) Ventura; daughters, Maria Guadalupe (+ Rogelio) Ramos, Maria Rosa (+ Jose) Baltazar, Maria Elena (Abel) Escobedo, Maria Josefina (Israel) Garcia, and Maria Socorro (Juan Manuel) Vargas. Also surviving him are 61 grandchildren; numerous great-grandchildren; and sister, Dolores Ventura. He is preceded in death by his parents; daughters, Elvira Ventura and Victoria Ventura; brothers, Ambrocio Ventura and Federico Ventura; sisters, Enriqueta Ventura and Catalina Ventura. Viewing will be held Wednesday, September 12, 2018 from 1:00 p.m. to 9:00 p.m. with a Holy Rosary at 7:00 p.m. at Cardoza Funeral Home Chapel. Viewing will continue Thursday, September 13, 2108 from 8:30 a.m. to 9:30 a.m. at Cardoza Funeral Home Chapel. Funeral Mass will be held at 10:00 a.m. at St. Theresita Catholic Church in Edcouch. Interment will follow at Anahuac Community Cemetery in Edcouch.